Last week, we asked developers to reconsider the idea of creating games for simultaneous release on both PC and Mac platforms. However, we cannot control what others do; we can only ask. So let's concede for the moment that things will continue as they are now -- very few games coming out on both systems at the same time, and Mac getting ports of popular PC games much later than their original release. What's an avid Mac gamer to do? Short of actually buying a PC just to play games -- and it must be said that the cost of a decent PC has dropped dramatically over the past few years -- there are a few options available, and they all contain the crazy voodoo called virtualization. Bear in mind that these are only the applications that I've personally tried myself. Check 'em out after the jump! 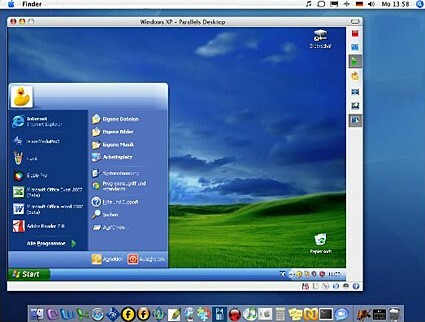 Parallels Desktop for the Mac is an application that allows a user to run Windows emulated within the Mac environment. It is now up to Version 5, and has been around since 2006, taking advantage of Macs that use Intel processors. 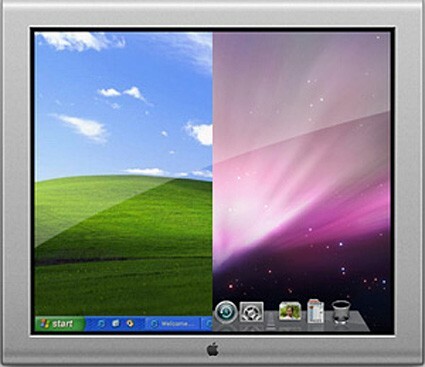 Parallels works by providing a completely virtual PC -- all software, yet tied to the Mac's hardware to function. Not specifically meant to allow playing games, it rather offers the complete Windows platform. As such, you can install any Windows application and it should work just fine. I have Parallels Desktop for Mac Version 4 on my 2.16 Intel Core Duo iMac, and I have to say that my experience has been somewhat uneven. I recently tried to play Torchlight, and was able to run the installer just fine. When it got to the point of actually executing the program, I was able to see the game's splash screen, then was shown an error message before Torchlight shut itself down. I have been unable to get the game to run. I had also attempted to run Age of Empires 3 and found it fairly slow and unresponsive once too many units popped onscreen. However, I was able to install and play the latest Popcap game Amazing Adventures: The Caribbean Secret just fine. Admittedly, it might be that all these games run well in Parallels 5, so take this personal experience for what it's worth. Your mileage may vary, but at $79.95, you might ask yourself if it's worth the price to find out for sure how it will run your PC games. The CrossOver suite of applications by CodeWeavers is another virtualization option for Mac users that operates in a slightly different fashion than Parallels does. Instead of the full Windows environment, each Windows application is self-contained -- you could run the PC version of Microsoft Office right in your Mac without having to fire up Windows at all. 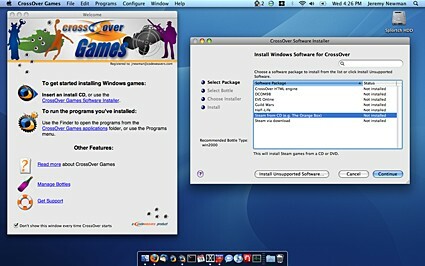 There are two applications for Mac users: CrossOver Mac, which includes support for Office, Internet Explorer 6 and 7, Quicken, and a few other PC apps; and CrossOver Games. CrossOver Games works the same way as CrossOver Mac, but its focus is to play specific games: Counter-Strike, Prey, Team Fortress 2, and World of Warcraft, among certain others. I was able to install and play Guild Wars with no problems whatsoever. However, if you venture beyond those supported games, you might run into problems. There is a way to attempt to install unsupported games, but it's a trial-and-error process. Some games will install properly but refuse to run, others might not install at all. The tentative nature of this process makes purchasing CrossOver Games an iffy proposition -- it seems unlikely that you'll want to play the PC versions of some of these older games badly enough to buy the program, especially since some of them already have Mac clients. 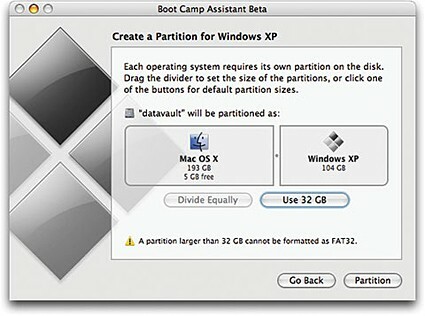 Possibly the best experience in playing PC games on my Mac comes from running Boot Camp. Installing Boot Camp is very easy, though it does require you to own a valid copy of whichever flavor of Windows you want to run, which is something the other two virtualization programs mentioned above don't ask of you. However, the benefits of using Boot Camp are immediately obvious: it's an actual copy of Windows, running directly on your Mac. With one exception, everything I installed and ran on the Boot Camp partition worked very well, both applications and games. The one issue with Boot Camp is that you must reboot your machine to access it, which almost seems beside the point to an extent. If I can't use my Mac at the same time as playing these PC games, then why wouldn't I just buy a PC and have done with it? There have also been mentions of strange video card issues. My iMac holds an NVIDIA GeForce 7600 GT, which has its PC analog, so I haven't necessarily run into any issues, but some PC games certainly optimize for cards from other vendors, so sometimes that issue rears its head. To be honest, the reboot process is a pain, but it boots into Windows XP (on my machine) fairly quickly, so it's not as onerous a complication as it might be. My personal wish for future Macs is that eventually Boot Camp technology will follow Parallels Desktop, and make Windows available directly within the existing environment without the need for a reboot.